Nainital is a glittering jewel and a perfect holiday destination in the Himalayan landscape. This beautiful valley is dotted with lakes and thus, earned the name of being the "Lake District" of India. This place's picture perfect beauty and serene lakes makes it a perfect destination for all kind of holidays. So, when are you planning a tour to this stunning destination? Located just 100 m away from Tallital Bus Stand, Hotel Himalaya is one of the most famous 3 star properties in Nainital. The hotel has 50 well appointed guest rooms categorized in four categories- Standard Room, Heritage Room, Deluxe Lake Facing Room and Heritage Family Suite. Apart from the comfy stay and delicious food, the hotel also provides excellent banqueting and conferencing facilities. Arrive at Nainital and get transferred to the hotel with the help of our company representative. Check-in to your room and spend the evening while relaxing amidst the natural beauty. Dinner and overnight stay will be at the hotel. After taking breakfast, proceed for a full day sightseeing tour of Nainital. 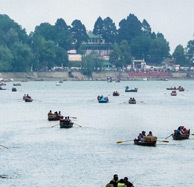 This tour will include various popular attractions of Nainital including Naina Devi Temple, Naini Lake (Nainital), the Mall Road, Naina Peak or China Peak, Dorothy's Seat, St. John's Church, Tiffin Top etc. Come back to the hotel, enjoy dinner and overnight stay. After having breakfast, check-out of the hotel and depart for next destination / back home.